With Tory MPs threatening to revolt and the #DUP pushing its anti-abortion line, #British PM is caught between a rock and a hard place. To put it rather crudely, British Prime Minister Theresa May must be bricking it after Ireland voted to end its abortion ban following Friday’s referendum. 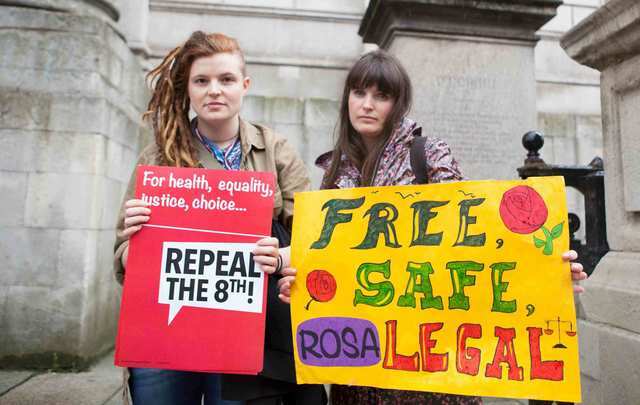 You see almost immediately after the result became clear the Republic’s victorious pro-abortion lobby began chanting “the North is next” in reference to Northern Ireland almost immediately after the historic referendum. As if anyone needs reminding, Northern Ireland is DUP territory, you know the unionist party led by Leader Arlene Foster who would probably bring back the ducking stool for those who disagree with her uncompromising views on abortion. This is the party that hold’s the UK Government to ransom because without the DUP’s support Theresa May would find it almost impossible to get any motion through parliament these days, so precarious is her position. The Conservatives, still the biggest party in the House of Commons, were forced to jump in to bed with the hardline DUP in order to have its support in key votes. The Conservatives’ 318 MPs and the 10 DUP MPs together make up more than half the MPs in the House of Commons. Just to add to the pressure a number of female Tory MPs are backing their colleague Dr Sarah Wollaston, chair of Westminster’s health committee, who says women in Northern Ireland should have the same rights as other UK residents. The Women and Equalities minister Penny Mordaunt, and her predecessors Amber Rudd, Justine Greening, Nicky Morgan and Maria Miller, have also called for reform of Northern Ireland’s abortion laws which are the most restrictive in Europe. Theresa May will try and say that this is an issue for Northern Ireland but there are many of us who believe it is high time it ended its abortion ban as well to give all women living there the right to a choice. While Northern Ireland has been without a government since January 2017, after a power-sharing deal between the DUP and Sinn Féin collapsed, it’s quite obvious Sinn Fein is buoyed by the referendum results. The party’s Mary-Lou McDonald and Michelle O’Neill held up a signs reading: “The north is next” as Saturday’s results in Dublin Castle were announced. However, the issue is out of Stormont’s hands due to the continuing stalemate – and pro-choice campaigners will be focusing their fight at Westminster, which presents a major headache for the Prime Minister. Obviously the DUP will be fiercely opposed to any such moves from Westminster as will the leading Tory MP for the 17th century – Jacob Rees-Mogg – but with rumblings elsewhere on the Tory benches this is going to prove a major challenge for the under-fire Prime Minister. The DUP has deep religious roots and has always said that any relaxation in NI’s laws could bring about abortion on demand. It has many supporters who feel the same and they are bound to resist Westminster taking advantage of the current lack of a devolved administration to push for abortion reform from London. Quite how May will pacify Arlene Foster while placating the tenacious Dr Sarah Wollaston and co remains to be seen. Brexit negotiations are reaching a delicate stage and without the support of the DUP and all of her MPs, May is scuppered. Talk about being caught between a rock and a hard place … this could be one political tightrope not even she can navigate.